We all know that the desktop computer no longer monopolizes the online world. Today, people use a wide variety of devices such as smartphones and tablets, along with PCs, to access web-based content, and e-learning materials are no exception. The use of diverse devices to access technology-enabled learning resources is compelling companies to develop responsive online learning materials, which can be accessed seamlessly on any device. Do you too intend to develop responsive online courses? How can you create device-agnostic e-learning courses that deliver high quality learning experiences across multiple devices? Among the various aspects you need to consider, the choice of the right rapid authoring tool is inarguably the most important. Today, we will examine the features of three powerful e-learning development applications that allow you to develop effective responsive online courses in a hassle-free manner, viz. Articulate 360, Adobe Captivate 2017, and Lectora Inspire 17. This widely used rapid authoring software comes with a host of applications that enable you to develop engaging courses for the web. One of these applications is Rise, which can be used to create device-agnostic online courses. Let us now look at the capabilities of this application. This online course development tool facilitates the development of good technology-enabled learning materials that can be accessed on all tablets, in any orientation, easily. It is possible to make optimal use of every pixel, to ensure effective learning on smartphones, using Rise. The cloud-based responsive e-learning development tool allows you to hide menus, scale down the size of media elements, and “re-flow” content, so that your staff can access the learning content seamlessly on smartphones. The Articulate application comes with a large library of pre-built responsive web-based learning development resources that make the creation of device-agnostic e-learning simple. You can use these resources to build learning interactions such as accordion, click-on-tabs, flashcards, and timeline. You can also explain processes and use interactive labeled images without any hassles. Rise also enables you to build multiple choice questions with minimal effort. It is possible to include screencasts in your responsive online learning resources, using Rise. The application is fully integrated with Articulate Peek, a screen-casting tool, allowing you to develop software training materials for multiple devices. This rapid authoring tool is used extensively in the L&D world to develop device-agnostic online learning resources. The e-learning development application comes with a host of features that help create effective responsive e-learning courses. Adobe Captivate 2017 comes with containers which automatically adjust the position of objects based on the size of the screen. This goes a long way in delivering good, hassle-free learning experiences across all devices. The rapid authoring tool allows you to customize containers easily, to meet your specific needs. Proper rendering of text is a key factor in providing smooth responsive learning experiences. Using Adobe Captivate 2017, you can collapse a lengthy paragraph to just two lines, prompting the learner to click to view the remaining piece of text. The rapid authoring tool enables you to develop a kit of desired font families for ensuring typography of high quality on all devices. You have the option to choose from several well-designed, device-agnostic themes. These themes come with flexible containers which simplify the development of e-learning courses for multiple devices. You can customize themes and use them across multiple projects. The application also allows you to come with your own themes. You can incorporate object transitions, including motion paths and rotation effects, seamlessly, in your device-agnostic online courses. You can come up with customized linear and scribble motion paths and determine the way objects move. The rapid authoring tool also allows you to generate previews of animations on hover and examine how they are rendered on the timeline. The application also allows you to come with different effects for devices with different screen sizes. This is inarguably the most useful feature of Lectora Inspire 17. 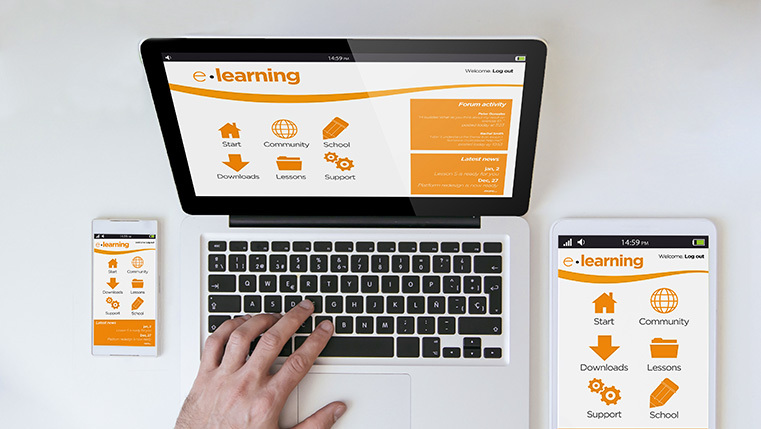 You can convert your legacy e-learning courses, developed using older versions of the tool, to device-agnostic learning resources with just a few clicks. You can then make adjustments, specific to different devices, to deliver excellent online learning experiences. Lectora Inspire 17 comes with several pre-built responsive e-learning themes, which allow you to build visually-appealing device-agnostic online courses. The rapid authoring application also comes with several page layouts that allow you to organize content in a convenient fashion and determine how it would appear on each type of device. This e-learning development software has a feature called CurrentView Variable which allows you to control how content is to be displayed and learner actions are to be performed, based on the device type and orientation. For example, if the learner is viewing the content in the portrait mode, and you want him to attempt a quiz in the landscape mode, you can display a message Rotate the tablet to the portrait mode to attempt the assessment. The choice of the right authoring tool goes a long way in developing an effective responsive e-learning course. Which tool do you use to create responsive courses? We’d love to know.